Do you have any extra, unused Christmas cards? Maybe extras from previous Christmases -- too good to toss, but that can't be used without risking sending out duplicates? 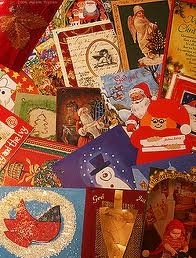 Consider donating your extra cards to "Operation Christmas Cards 2010." This organization is committed to providing a card during the holidays to each deployed soldier, extending them warm wishes and appreciation during what may feel like a lonely time. We will also be sending cards to Fred and Carol's son Freddie, who grew up in our church, and is serving in Afghanistan. Cards need to be sent out at least 3 weeks before Christmas to arrive in time, so don't delay! If you would like to participate, please contact us for more details.